Mark Cracknell from Aviva looks at all the factors that have influenced recent protection parket growth and asks what must happen for growth to continue. Why growth and why now? It is understandable there is a little scepticism about recent growth in the protection market, given the extended period we endured a flat market. Some may think it is going to be short lived and that we cannot expect the trend to continue. My view is that growth like this can continue and that we need to dig beneath the surface to understand the myriad of factors that may have contributed to the first market growth we’ve seen since the days of gender neutral pricing. So here goes. Over the recent period of protection growth there has been a notable absence of market ‘shocks’ that arguably stunted its growth in previous years. Gender-neutral pricing, the Retail Distribution Review (RDR), Mortgage Market Review (MMR) and other regulatory changes all appeared to have a direct impact on sales, thereby preventing growth. In the last few years we have seen greater innovation from improved protection products with the best critical illness coverage to date. Investment in services and technology are making it easier to gain access to cover. Providers like Aviva are seeking ways to offer greater choice whilst making the most of advancing technology like iGPR to get customer protection more quickly. Industry initiatives such as Seven Families have created greater awareness of protection products and the pitfalls of not having protection in place. Government welfare reform may have driven greater demand for protection products as consumers seek their own protection, to establish greater peace of mind and security. 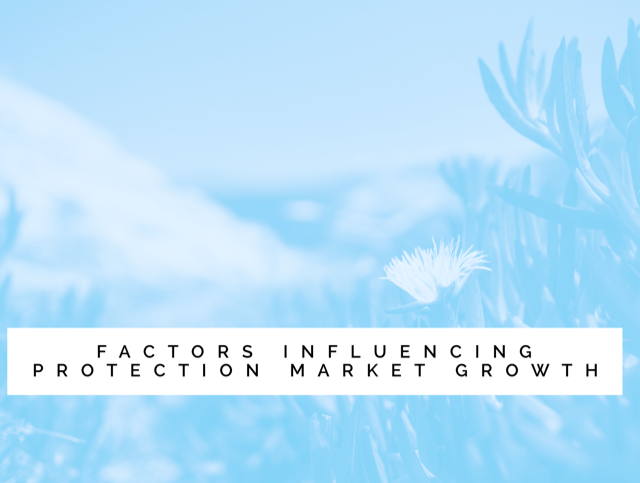 If regulatory factors such as RDR and MMR were to blame for preventing growth in the protection market it is possible that we may now continue to see the upwards trend. There is no imminent regulatory change on the horizon that would have the same adverse impact on the protection market. Although the real effects of Brexit are yet to be seen. However, if it drives greater unemployment (as some predict) this may not be good for protection. We know from the Aviva Family Finances Report that worryingly some people will choose to cancel their insurance policies in order to free up disposable income, particularly as a result of divorce or separation. We should have retention strategies to ensure that customers choosing to cancel fully understand the risky implications of doing so. Time will tell. Whilst our ability to influence Brexit is limited, there are things that remain within our control, such as how we engage with customers on the subject of their health and financial wellbeing. There is still a lack of knowledge around how much protection insurance costs and the real exposure of not having any in place. More needs to be done to ensure that we are educating consumers on matters like average premiums, access to state or employer provision. Continuing to push the boundaries for new and innovative propositions should also allow us to reach new audiences for protection products. This may come from far better application processes that make purchase quicker and slicker. Or continuing to look for ways that our products will engage with under-provisioned markets such as renters or millennials. We must push for greater speed over bringing products to market, and better communicate with the public over the risks they are exposed to, if they do not have protection. We must continue to push for a mandatory protection conversation linked to a mortgage sale and equally a review of protection needs when divorce occurs. What level of growth constitutes a successful market? Data gathered by Aviva indicates the protection market grew by approximately 17% in the last 2.5 years. Any growth is good to see, but most of us that work in the protection industry would agree that the quest is much more far-reaching. Day in, day out we see the impact protection policies have on customers’ lives. For someone just diagnosed with cancer, knowing that their mortgage can be paid, and their family no longer need to worry about money can make a huge difference to their focus on getting well. Many of us who work in the industry will not feel satisfied until we have a much lower protection gap in the UK. The FCA’s Financial Lives Report told us that approximately 35% of the UK adult population have some form of protection product. This means around 33 million adults living in the UK are unprotected. This is far too many unprotected people, especially when you consider that Aviva research shows nearly half of parents with dependent children could not support their lifestyle for a month if the main breadwinner was unable to work. So, let’s not take our foot off the gas, and let’s work together as an industry to deliver all that is possible to ensure the growth trajectory continues.